Humility calls us to trust more and more in God and God's love for us, especially in moments when life seems out of control: relational and family problems, health issues, economic difficulties, spiritual dryness, etc. Humility and trust go hand in hand. Humility also asks us to become more and more like our God. It calls us always to be bigger: more generous, more compassionate and merciful and more other centered. As C.S. 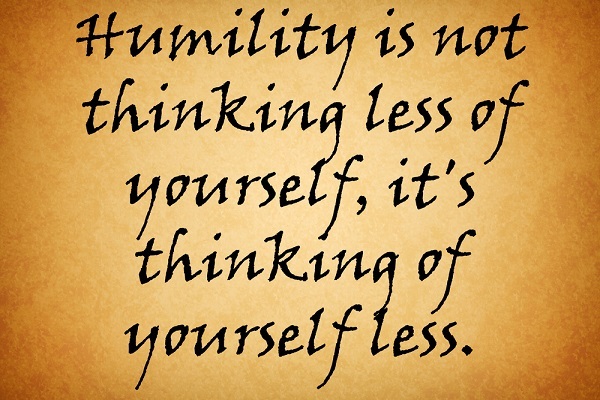 Lewis wrote: "Humility is not thinking less of ourselves; it is thinking of ourselves less." A danger to being humble is not becoming bigger, not keeping God at the center. In The Brothers Karamazov, Dostoyevsky wrote: "Once created in the image and likeness of God, humans have never ceased trying to recreate God in their own." God does not agree with our pettiness, judgmental moments or our biases. This week, the little but vital virtue calls us. Let God be God and enjoy being the beloved son or daughter you are. Let's try to be more accepting and less controlling. And let's trust that God is love and walks with us in love at all the moments of our life.